Sodium lauryl sulfate is a common ingredient in many shampoos that gives it a thick, foamy lather that seems to ensure TV commercial-clean hair. Although shampoos that contains this lathering agent might clean your hair well, they may also dry your scalp or strip the color from dyed hair. With many salons recommending sulfate-free shampoo after hair coloring or certain chemical treatments, there is a growing number of hair care products available that effectively cleanse and nourish hair without depending on sulfates. After "Real Simple" magazine editors tested 195 different shampoo products, they chose Aveda's Smooth Infusion as the best natural product. This moisture-infused, sodium lauryl sulfate-free shampoo is designed to help reduce frizz and stop flyaways while also coating your hair to protect it from heat damage. Its conditioning power comes from all-natural, organic ingredients like aloe vera and guar bean extract. Smooth Infusion earns points not just for its natural ingredients, but also its environmentally sustainable bottle made of recycled plastic. David Babaii's volume-boosting shampoo is made without any type of sulfates, parabens or petroleum. The editors of "InStyle" named it one of the best green haircare lines on the market. As it lifts away oil and dirt to enhance your hair's shine, the shampoo also conditions and soothes with natural ingredients like coconut oil and white ginger flower extract. "Elle" picked Avalon Organics' Revitalizing Peppermint Shampoo as one of the top-performing sodium lauryl sulfate-free shampoos, saying it helps to clarify your hair for less buildup of shine-reducing product residue. It's free of sulfates and parabens, contains no fragrances or dyes and isn't tested on animals. The shampoo's plant-based detergents clean your hair and scalp with oil-reducing ingredients like peppermint oil. Meanwhile, natural hair-nourishing conditioners like vitamin E and babassu oil help to repair your hair shafts for a naturally glossier look. 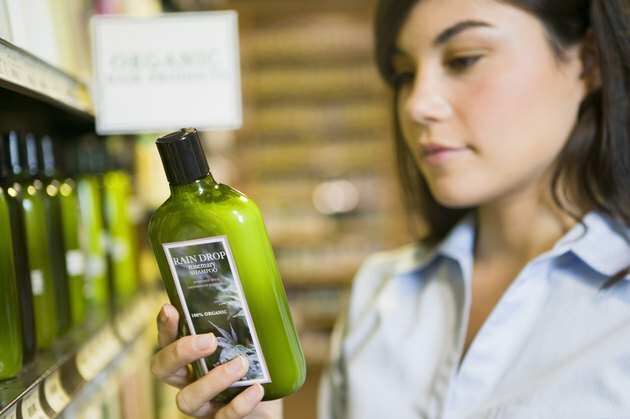 Sulfate-free shampoos aren't only found in salons or from specialty organic brands. For mainstream SLS-free washing, "InStyle" recommends trying L'Oreal's shampoo. The magazine says it can help to gently clean your hair without stripping natural oils and color from your hair like traditional shampoos do. Its conditioning ingredients infuse your hair with moisture and help combat problems associated with color-treated hair, like dry and brittle ends.